What special gift do you get your spouse to help celebrate your wedding anniversary, a birthday or holiday? Cologne? Jewelry? More stuff? If your spouse is at the stage in life where he or she already has too much stuff (Who doesn’t have too much stuff? ), perhaps a tribute legacy letter is the perfect gift to express your love and appreciation. A tribute legacy letter can also be an amazing love letter to a spouse or life partner. It can be a wonderful expression of your deep appreciation, admiration, and respect for someone you value. It shares what legacy you received from that person by incorporating favorite stories and memories that help capture the essence of your mate and the uniqueness of your relationship. Cathy and Mark Lieblich sharing Mark’s legacy letter with his mom. There are many types of tribute legacy letters. There are younger people who write a tribute legacy letter to an elder such as a parent, grandparent, teacher, or mentor. There are organizations that create intergenerational mentoring campaigns using tribute legacy letters to thank special volunteers, employees, or residents. Nonprofit organizations can also use legacy letters as a philanthropic building tool by giving donors a free legacy letter ghost writing service, which helps donors create legacy letters. These letters could focus on donors’ generosity and causes important to them, which they in turn can share with loved ones and friends to encourage their philanthropy and civic engagement. 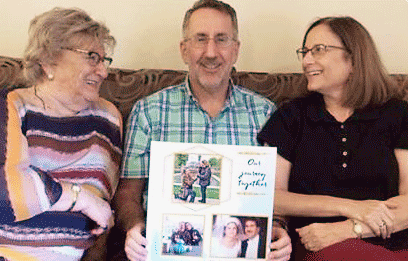 Not only will a tribute legacy letter book be a keepsake for one’s family, but it can be an important resource for care partners if home care, adult day care, assisted living or nursing home care are needed by the person in the future. In order to provide person-centered care, the Pioneer Network values to “know the person” and “relationship is the fundamental building block of a transformed culture” are of utmost importance. Meaningful relationships are important throughout our lives and even more so when there are care partners involved, regardless of the location of where the care is provided. In order to build meaningful relationships, it is important that both sides of the relationship know each other as people. The tribute legacy letter book goes a long way in making this happen. If you, or an elder you know, want to write a tribute legacy letter to a spouse or life partner, here are sample questions to help generate content. Select which questions resonate and write the answers. Then after reviewing the answers rewrite them in a letter format to your loved one. That’s how easy it is to develop content for your tribute legacy letter. What were your first impressions of your spouse or life partner? Do you recall the moment when you fell in love or realized you wanted to spend your life with this person and why? What are your two or three favorite memories of your loved one? What are the two or three things you most admire or appreciate about him/her? What do you consider are her/his most significant achievements? Why? What are some of the difficulties or challenges she/he faced in her/his life? How did she/he handle these? What did you learn from her/him about overcoming obstacles? Can you recall a choice or decision you made based on a value or principle taught to you by your loved one? What trait(s) of your loved one do you most wish to emulate? Why? Can you share a story or two that helps illustrate these traits? What talent or skill does your loved one have that you would like to develop? Why? What life lesson(s) did your loved one impart to you that were most useful? In what way? Was there a crisis in your life that your loved one helped you overcome? How? What are profound ways your loved one helped you, or someone you love? You can also write a legacy letter to a loved one who has passed away. An Honoring Your Angel Tribute Legacy Letter captures the treasured stories, memories and unique qualities of your deceased child, grandchild, sibling, spouse or other loved one or friend to ensure she or he will always be remembered. I hope you are inspired to write a tribute legacy letter for someone special in your life because we truly need more love letters in the world! To learn more about legacy letters go to www.legacyletter.org .